Bring out your inner romantic with this cute pink print top by Alannah Hill. 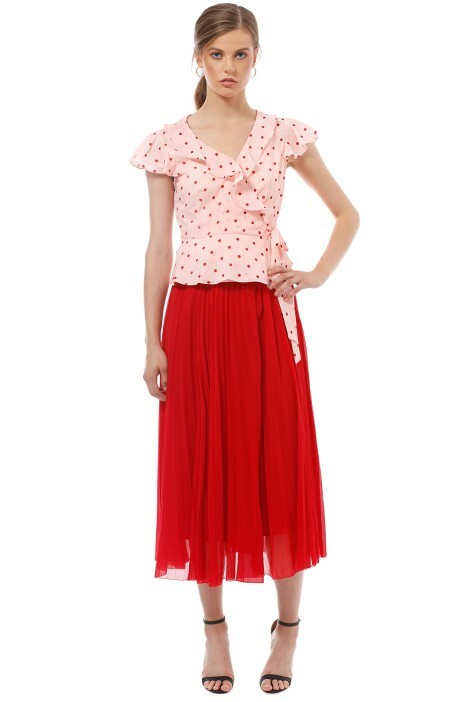 Made from crepe de chine, the pink and red polka dot top features a V neck with ruffled details and a peplum hem. With a flattering wrap-style design and fluttery short sleeves, it’s perfect to hire for your next date night or daytime event. Keep your look feminine and flirty for date night by styling it with your favourite pair of skinny jeans and block heels. Finish off your look with dewy makeup and carry a foldover clutch for your evening essentials. Head to our blog for makeup looks to try for date night! Pair this with the Cicely Midi Skirt. WAIST: Fitted with a wrap waist tie. Kiss Me Quick Wrap Top is rated 5.0 out of 5 by 1. Rated 5 out of 5 by Rosalind from Pretty I wore this to work and it was lovely. It comes with a cami and has adjustable side buttons so you can get the fit right.